After a long drive and late night the day before, we awoke in Ottawa to find a good deal of snow falling. After getting off to somewhat of a late start, we commenced birding. Our Ottawa adventure began at the Maple Grove Road Maintenance Facility, searching for Gray Partridge. We drove around the entire site twice, but failed to catch a glimpse of this realtively easy bird (at least at this time of year). We regrouped, heading for Rifle Road and the Hilda Road Feeders, a place that has been hopping the past few weeks. 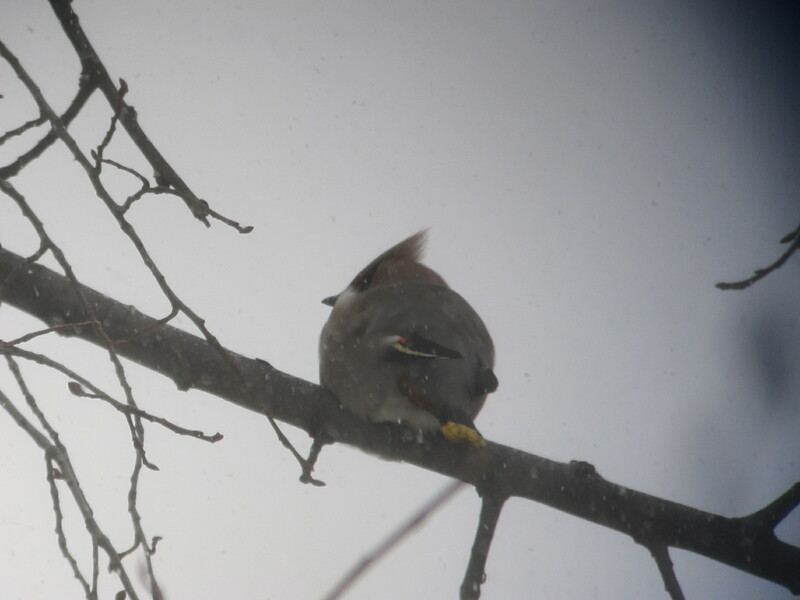 At the beginning of the road I told my companions to keep an eye out for waxwings, and sure enough, 3/4 down the road, Dave spotted a group of 60+ Bohemian Waxwings in a deciduous tree. This is one of my favorite birds, and seeing them again was a treat. We enjoyed superior looks through the scope, including some birds feeding on berries. Soon, a large flock of 130+ birds flew in and together with the group of 60 flew off. Quite a sight! After a stint with the Bohemians, we moved on to the Hilda Road Feeders, just around the corner. Recently, two Hoary Redpolls had been reported from the feeding station, and we were hoping luck would be with us on this stop. 30-50 Commons were also present, giving us a lot of redpolls to sift through. We soon commenced scoping the flock. Meanwhile, other birds and wildlife frequently took our eyes off the redpolls. 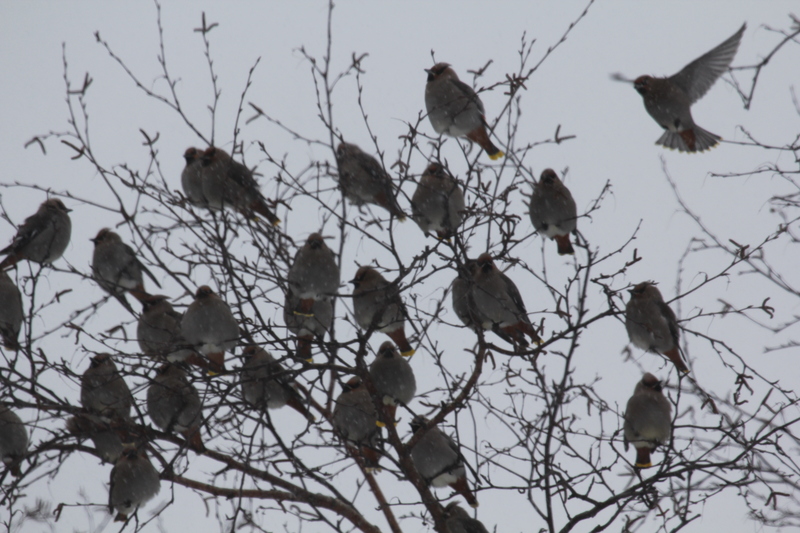 And soon, the flock of Bohemian Waxwings appeared once again, showing nicely near the feeders. We soon started seeing some paler redpolls, but none appeared to be Hoaries. 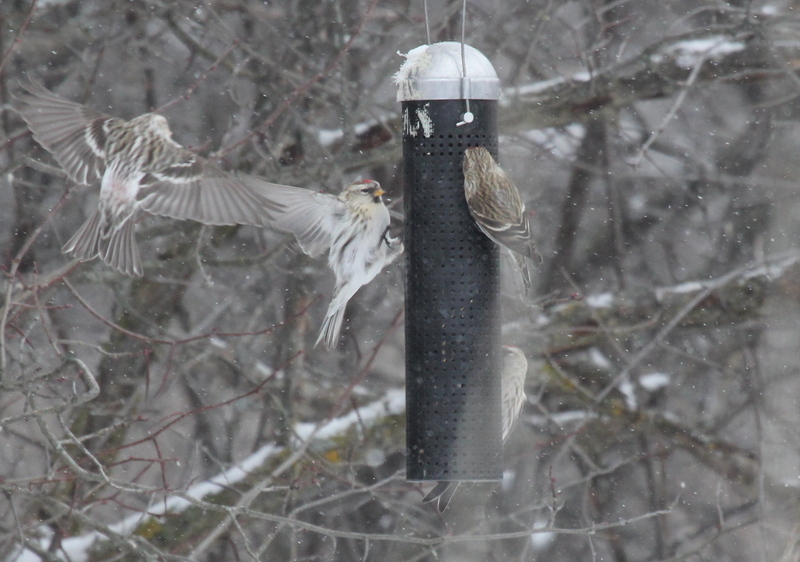 After a while it seemed like the redpolls had stopped visiting the feeders. There will still a few around but it worried us as our chance at Hoary Redpoll seemed to have droppeed. 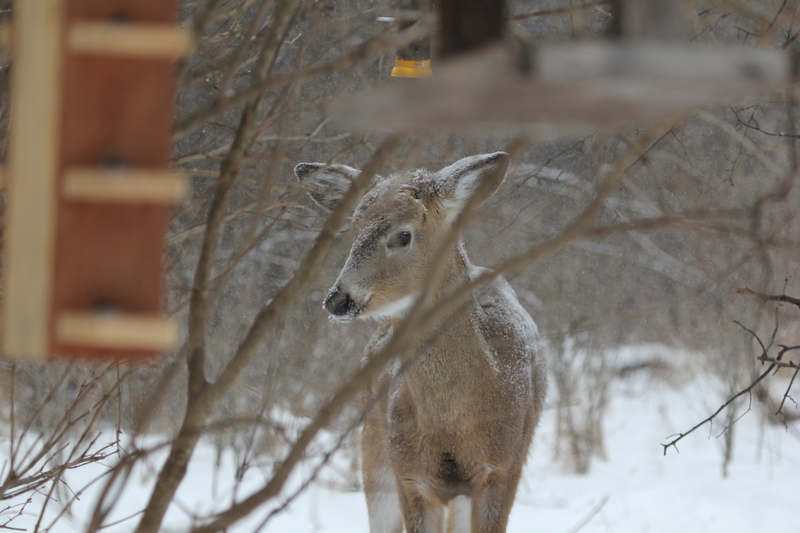 However, I soon spotted the flock visiting a well-hidden feeder at the back of the feeding station. The only way to view that feeder was to leave the warmth of the car. Together, we braved the elements, scopes in hand. 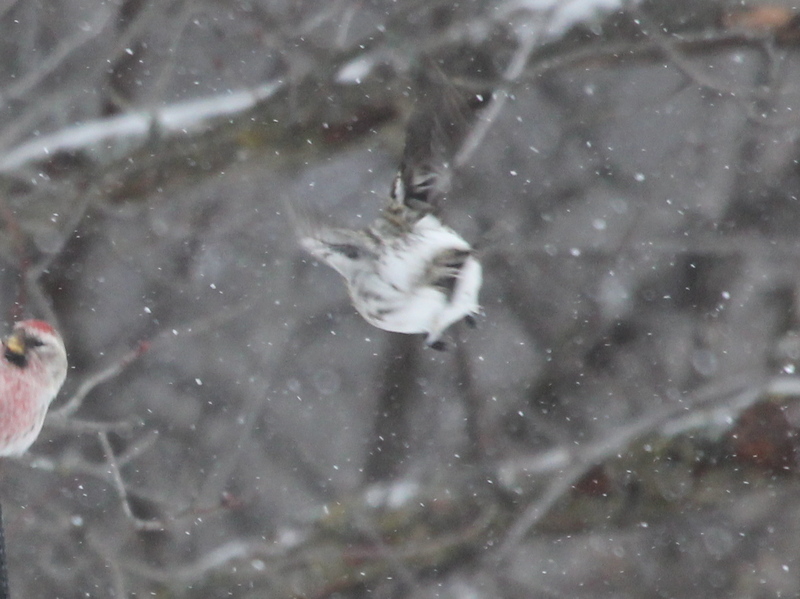 For 20 minutes we studied the redpoll flock in very snowy and cold conditions. After a bit of scanning, I spotted a very good candidate for Hoary Redpoll, and soon with a look and photo of the white rump, we clinched the ID! 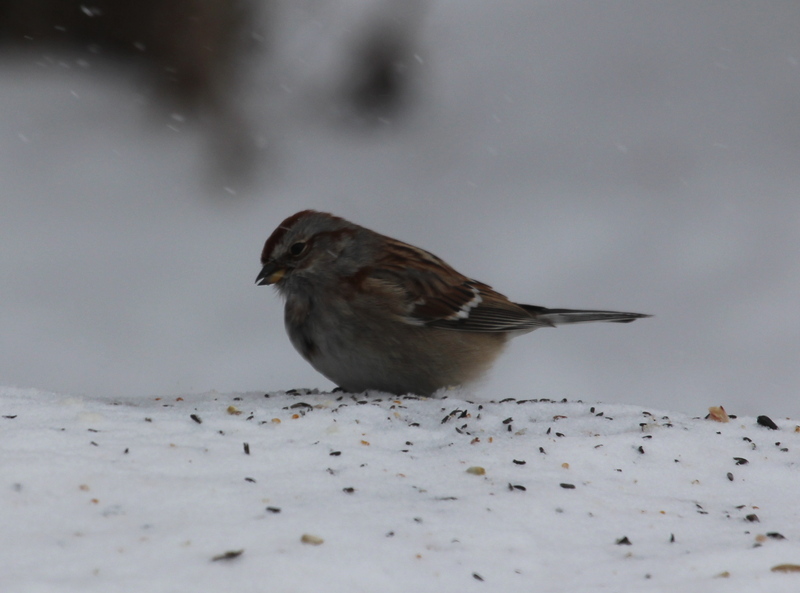 Intense study confirmed this bird as a female-type Hoary Redpoll. This bird soon flew off, but a few minutes later, a male Hoary Redpoll appeared and spent a bit of time feeding with the Commons. In the midst of studying these birds, an interesting gull flew over, headed towards the waterfront. It had a dark mantle and a bit of gray on the underwing, which recalled Great Black-backed. However, this bird was much too small and had slim wings, and a lighter mantle. We soon identified it as a Lesser Black-backed Gull, a totally unexpected bird. After awhile a THIRD Hoary Redpoll appeared, this one a first winter bird. Unfortunately, we were unable to spend much time with this bird, as we had to get moving. 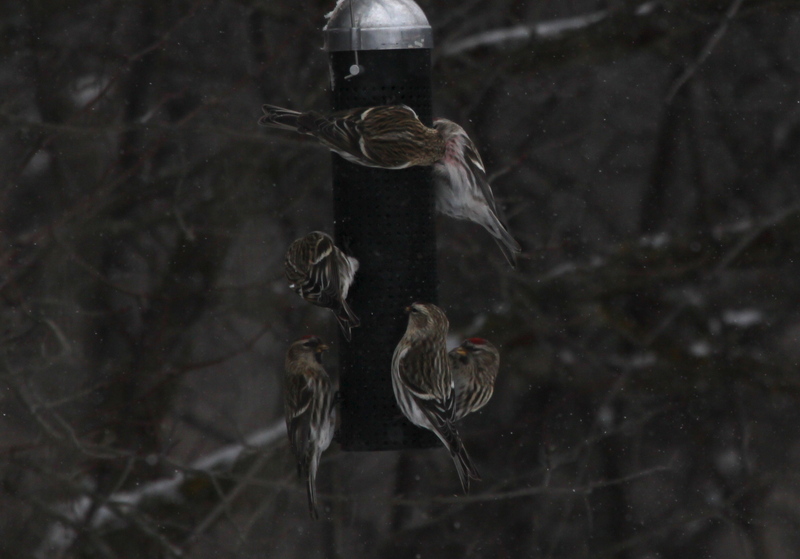 It was a wonderful time studying these birds and getting better at redpoll ID. Our last stop was the Rideau River for Barrow’s Goldeneye. Unfortunately, the abundant Common Goldeneyes failed to produce anything and we still had a six hour drive ahead of us. Overall, it was a very successful day. We had our misses, but had some amazing experiences with some terrific birds as well. After all, what’s birding without dipping on targets? This entry was posted in Ontario - Jan 2011. Bookmark the permalink. I feel cold just reading that. Quite an adventure for you guys! So happy you got to see so many of the birds that are not wintering in CT. Such a treat to see so many species–some unexpected! Looking forward to hearing about the rest of your journey.